Corn and grain sorghum (Sorghum bicolor subsp. bicolor L) are among the top cereal crops world wide, and both are key for global food security. Similarities between the two crops, particularly their adaptation for warm-season grain production, pose an opportunity for comparisons to inform appropriate cropping decisions. 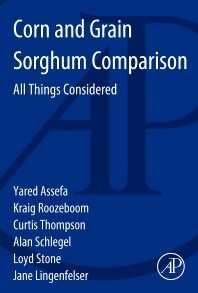 This book provides a comprehensive review of the similarities and differences between corn and grain sorghum. It compares corn and sorghum crops in areas such as morphology, physiology, phenology, yield, resource use and efficiency, and impact of both crops in different cropping systems. Producers, researchers and extension agents in search of reliable scientific information will find this in-depth comparison of crops with potential fit in dryland and irrigations cropping systems particularly valuable.